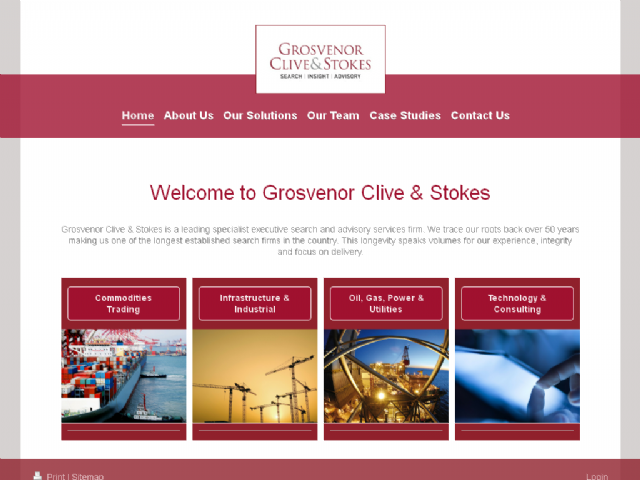 Grosvenor Clive & Stokes is a leading specialist executive search and advisory services firm. We have a particularly deep expertise and long history of working in the Energy & Infrastructure, Professional Services and Technology, Media & Telecoms sectors but have also supported clients in a diverse and varied mix of other industry sectors. Our highly experienced consultants, supported by an in-house research capability, provide a range of services which enable our clients to attract, integrate and retain high calibre business leaders wherever they are needed. We also utilise our specialist knowledge, deep understanding of our core markets and comprehensive research capability to help our clients identify and understand potential new markets, service lines and merger & acquisition opportunities.